Angelo Luis Muniz, 47, and his 1 ½ year-old daughter, Perfection Angelas. ARCATA – On Saturday, Sept. 1 at about 11:19 a.m., Eugene Police Department broadcast information of an Amber Alert that had been issued in Oregon. The information detailed a parental kidnapping from the Oregon Department of Human Services (DHS) facility in Eugene, Ore. 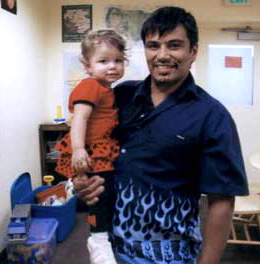 The subject, Angelo Luis Muniz, 47, of Lebanon Ore., was suspected of abducting his 1 ½ year-old daughter, Perfection Angelas, while on a supervised visit. The information specified that Muniz suffered from mental disorders and substance abuse. Oregon authorities suspected Muniz was en route to Mexico and was traveling down the coast in a 1991 Mazda pickup. Humboldt Area California Highway Patrol (CHP) Officer J. Bowen monitored these broadcasts and set up on southbound US-101 at Bracut. At 1:35 p.m., Officer Bowen observed the suspect vehicle pass his location and he began to follow it. CHP Officer P. Craft responded from nearby to assist. Officer Bowen conducted an enforcement stop at the Target parking lot inEureka. The suspect and victim were not in the vehicle. The vehicle was occupied by two adult females, Lorie Garza Ramirez and Julie Christina Raas. After obtaining information from the females in the vehicle, Officer Bowen responded to Arcata. After an investigation and search, Officer Bowen located Muniz and the abducted child at Redwood Park in Arcata. Muniz was arrested on a warrant issued for the kidnapping, and Perfection Angelas was taken into protective custody. Julie Raas was also taken into custody on charges of delaying and obstructing officers during the investigation. Perfection Angelas appeared to be unharmed and in good health upon Officer Bowen locating her. She is again in the protective custody of The Oregon Department of Human Services. This entry was posted on Tuesday, September 4th, 2012 at 2:06 pm	and is filed under News. You can follow any responses to this entry through the RSS 2.0 feed.